Above: 1978 Grade 1 French Immersion. Photo by William Dumanski. By adopting French immersion so early in the program’s history, Connaught found itself on the edge of a volatile debate about French education rights that was then raging in Saskatchewan. 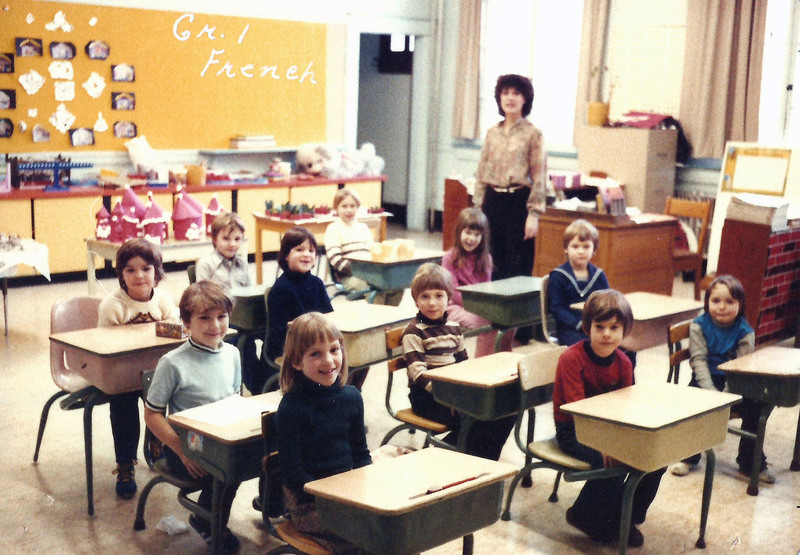 Between 1977 and 1981 alone, francophone groups charged that the province was ignoring their education rights and even committing “cultural genocide;” ratepayers in a small town near Regina voted expressly to have French removed from their curriculum; a variety of French-speaking groups asked to form their own distinct school boards; new provincial regulations guaranteeing French-language instruction were implemented, but condemned as vague and ineffectual; a Saskatoon-area board of education was taken to court for dropping high-school French instruction; and French teachers resigned and parents pulled their children out of a Prince Albert school during a heated debate over its French program. The relationship between French and English, and between parents and education officials, was hardly one of cooperation. The provincial battle between French and English didn’t seem to spread into Connaught’s halls, however, and the program forged ahead. And slowly, the number of interested students grew: by 1980, although a shortage of students had cost the school its French kindergarten class, it had gained immersion classes in Grades 1 and 2, bringing enrolment up to 22. Grade 3 was added the following year, but the program was for the time being capped there. Connaught students entering Grade 4 immersion were sent to Lakeview school until Connaught expanded its program again a few years later. Low enrolment made maintaining and expanding Connaught’s immersion program difficult – in 1980, Massey school’s French student outnumbered Connaught’s by more than six to one. By the early ’80s, though, low enrolment had been eclipsed by another problem. Connaught had dodged the language wars of the ’70s, but now found itself split along socio-economic lines. When the immersion program began, principal Bill Dumanski noticed that it attracted different – generally wealthier – students than the school was used to, but that they seemed to fit in easily enough. That, however, was during the ’70s. By the early ’80s, Connaught had become a community school, focused on the needs of poor and marginalized students. The idea of inviting economically privileged students to share the space drew plenty of criticism, and arguments ensued about whether the program should be expanded. “You have to understand that the majority – not all, but the majority – of the kids in French immersion came from pretty affluent families. And the rest of the community school was (mostly) from people on the poverty line or below. And so you had the haves and the have-nots,” explains Sue Deranger, who was Connaught’s community school coordinator at the time. She can’t recall any of the poorer and often First Nations “have-not” students enrolling in the French program. With time, thankfully, some learned to cross the divide rather than just accept it. When university student Francis Marchildon, a francophone from the small town of Zenon Park, arrived in the mid-’80s to do his education pre-internship, he was impressed to see First Nations and Métis kids in the immersion program. “There were a few First Nations kids in the French Immersion, so for me, being francophone, it was really cool because it was kind of like a rebirth of the Metis culture, in the sense of the francophones and the First Nations coming together,” he says. Damon Badger Heit, a student who later returned to help construct the school’s ‘Friendship Circle,’ may well have been one of the First Nations French immersion students that Marchildon remembers. Badger Heit graduated Connaught in 1992, an immersion student all the way through – but he didn’t shy away from those not in his program. “I have quite a few friends from (Connaught,) and a lot of the friends I still have were English students,” he says. Even aside from the economic divide, the program’s growth did not always come smoothly. Finding teaching materials wasn’t easy, especially since those imported from Quebec were often too advanced for the immersion students. “We’ve resorted to using just about anything we can find,” principal Dumanski told the Regina Leader-Post in 1980. And Regina’s French Immersion program came under fire in November 1908 – first when the Board of Education met behind closed with a small group of parents critical of the program, and later that month when the Leader-Post ran an article outlining an array of mistakes in worksheets prepared by French Immersion teachers. The tension came to a head the following month in a larger, public, and stormy meeting between parents and the Board of Education, but the meeting turned out positively – with a near-unanimous vote of confidence in the French Immersion program itself. That support was bolstered by a report released early in the year, which analyzed Massey and Connaught students’ tests and found their French skills to be roughly equal to other immersion students across Canada, and the English and math skills to be slightly higher than other local students. Putting its tumultuous early days behind it, Connaught’s French immersion program continued to increase the number of grades of offered within the school, and by the mid-’80s covered kindergarten to Grade 7. In the fall of 2002, the Grade 8 immersion program at Campbell Collegiate –where Connaught students were sent after completing Grade 7 – was closed. Connaught absorbed the teaching of the grade, finally giving it a complete K-8 French Immersion program.